Craig A. EVANS, James A. SANDERS (éd. ), The Function of Scripture in Early Jewish and Christian Tradition, (JSNTS 154), Sheffield : Academic Press, 1998. 24 cm. 350 p. ISBN 1-85075-830-1. £ 55. Steve MOYISE (éd. ), The Old Testament in the New Testament, (JSNTS 189), Sheffield : Academic Press, 2000. 24 cm. 302 p. ISBN 1-84127-061-X. £ 49. Ulrich MELL (éd. ), Die Gleichnisreden Jesu 1899-1999. Beiträge zum Dialog mit Adolf Jülicher, Berlin/New York : Walter de Gruyter, 1999. 23 cm. 293 p. ISBN 3-11-016753-0. DM 188. Martin C. ALBL, ‘And Scripture Cannot Be Broken’. 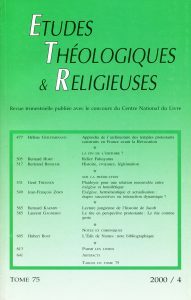 The Form and Function of the Early Christian Testimonia Collections, (NTS 96), Leiden/Boston/Köln : Brill, 1999. 25 cm. XVI-336 p. ISBN 90-04-11417-3. Fl. 198,33/$ 111.